We Won with Print Media! Thank you for voting us the winner of four prestigious print media awards for Ultra White Blockout, Canvas Prime and Geo Mesh fabrics. TVF Media stands out in the crowd! Our Ultra White Blockout is a double-sided bright white fabric that is engineered with a deep black blockout layer in the center for beautiful, vibrant imagery and excellence in double-sided graphics. This innovative blockout fabric won both the Fabric & Textile and Grand-Format Media categories in the 2015 Wide-Format Imaging Readers’ Choice Top Product Awards. The winner of the 2015 Wide-Format Imaging Readers’ Choice Top Product Award for Fine Art is our Canvas Prime. 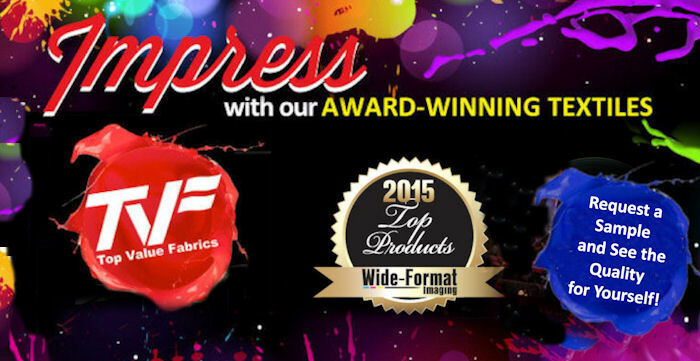 This 100% polyester woven fabric offers a bright whitepoint and yields outstanding color consistency and excellent image sharpness when printed. Canvas Prime is a heavyweight, REACH Compliant banner fabric that offers versatility and vibrant printing capabilities. Our award-winning Geo Mesh banner fabric has a bright whitepoint and is knitted with high tenacity yarn which provides the fabric with high tenacity strength and durability. This innovative mesh prints vibrantly and yields outstanding color consistency and excellent image sharpness when printed. Geo Mesh is REACH Compliant and won the industry award for “Best Green Product” at the 2014 ISA Expo. Come visit us at the ISA Expo, across from HP in Booth #532. We look forward to seeing you there!